When we see superheroes on the big screen, they have unworldly powers, fight for good, and leave us awestruck with their world-saving deeds. 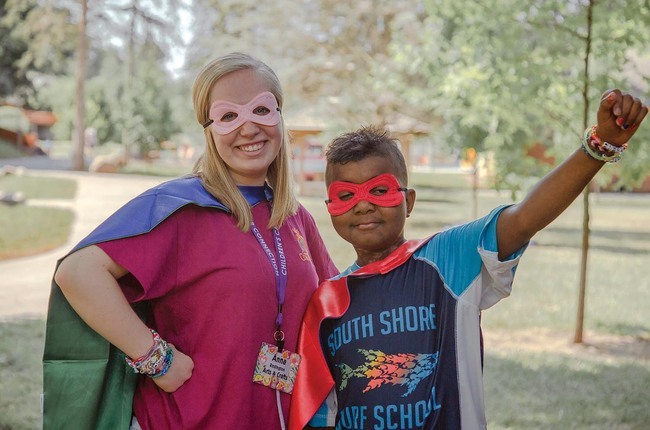 Spend a day at Camp Heart Connection and you will see real-life superheroes who have battled for their lives, fought for their brother or sister, faced seemingly insurmountable odds, and you will be inspired. Camp Heart Connection, a program of the Children&apos;s Cancer Connection, consists of two, week-long summer camps, one for oncology patients and one for their siblings. Both camps provide the opportunity for children affected by childhood cancer to know they are not alone in their journey and experience a week of normalcy in a camp setting. "Camp is an opportunity for our campers to spend an entire week knowing, without even talking about it, that their cabin mates have gone through similar experiences," said Melissa Beaman, Director of Program Services for Children&apos;s Cancer Connection. "Children can connect with others who understand what it&apos;s like to grow up in a hospital, to be the bald kid in elementary school, or struggle with the many emotions of having a sibling with cancer." Children&apos;s Cancer Connection is based in Des Moines but serves the entire state of Iowa. Each year approximately 185 oncology campers and 250 sibling campers attend camp, including children from Black Hawk County. The Community Foundation of Northeast Iowa has been a partner in helping Black Hawk County campers attend the camp, awarding over $12,000 in grants since 2011. Grants to Children&apos;s Cancer Connection from CFNEIA&apos;s Black Hawk County discretionary grant process have provided 31 camper scholarships. "Grants allow us to not charge the families to participate. They are already facing huge financial burdens and have such an emotional stressor that we hate to add a financial stress on our families. These grants allow us to do most of our programming at little or no cost," said Melissa. "For us to always be able to provide camp and never have to say no to a family is something we really feel thankful for."